As The Gardener wraps up the late crops and begins planting for Spring, an abundance of peppers have entered the kitchen. Most of these prove very tasty when roasted and used in a casserole, on a hamburger, or in a salad. 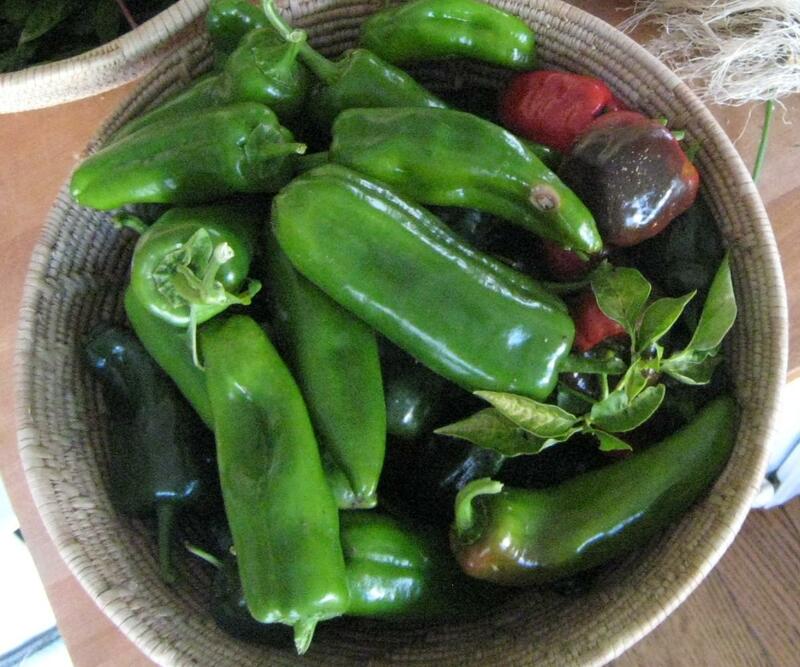 Roasting softens the pepper, concentrates the flavor, and facilitates peeling. I know of three ways to roast peppers. If you know others, please share. If you have a gas stove you can fire up the burner and place the pepper right on the grates as close to the flame as possible. Turn with tongs until most of the skin is charred. Once they’re properly roasted I move them to a bowl of water to rub off the skin. It should separate very easily. Alternatively you can place the hot peppers in a closed container to let them steam a bit. The peel should slide right off after a few minutes. If you have a gas barbecue grill you can remove the grates and get the pepper close to the flame. 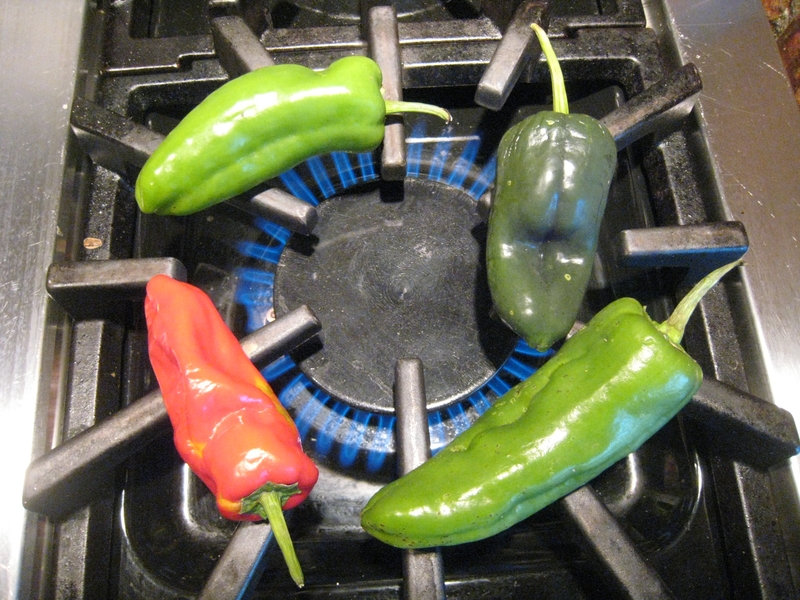 This is probably the fastest method because you can fit more peppers over the flame than you can with the stove. Stay close and keep turning. Peel as noted above. 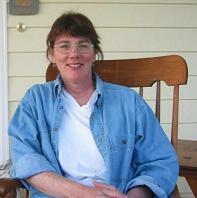 In The Art of Simple Food Alice Waters describes an oven method for roasting peppers. Place washed and dried peppers on a baking sheet in a 450 degree oven. Leave at least 1/2 inch of space between each pepper. Check every 5 minutes and turn as they brown. Keep turning until the skin is blistered and black and the peppers are soft. This will take about 35 minutes. We usually like to broil our peppers in the oven on a cookie sheet (with tin foil to make clean-up easier). Then we transfer to a bowl to cool, with a damp towel to hold in the steam. Once they’ve cooled, we then peel over the bowl, saving all of the juices. We prefer this approach to the water bath so that we save the juices and don’t wash off any of the roasted flavor. One of our favorite recipes for roasted red and yellow bell peppers is a Tapas that uses the pepper juice in a tangy sauce that you drizzle over sliced roasted peppers, kalmata olives, capers, and then dress with marjoram. Broiling. Brilliant! I also like the “over the bowl” method of peeling. Thanks!